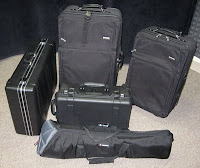 Densho's video equipment is packed and ready to go! We’re taking it all on the plane with us, a combination of carry-on and checked baggage. We now have to deal with the addition of airline fees for more than one checked piece, as well as the surcharge for overweight luggage. With a new (and much smaller) camera and tripod this year, carrying all our gear looks to be much more manageable than in the past. Looking forward to getting underway!